In a widening investigation of the Los Angeles Police Department’s cadet program, Chief Charlie Beck on Sunday announced he has suspended training for cadets at the 77th Street Division and Pacific Division, where three cadets arrested on suspicion of stealing police cruisers were based. The move is part of a “top-to-bottom” review of the citywide cadet program following revelations that besides the theft of three cruisers, the cadets may have also stolen other police equipment and posed as sworn officers. The suspensions are in effect pending the outcome of the investigation, officials said. Two of the accused cadets were assigned to the 77th Street Division and the third to the Pacific Division, said Josh Rubenstein, LAPD public information director. The teens, ages 15, 16 and 17, were not identified because they are minors. They were booked in connection with the theft of the cruisers and other LAPD property, Beck said. He added that all three were involved in the vehicle thefts but that it was not immediately clear which of them may have been involved in taking the other equipment. Department officials said the three cadets led officers on car chases through the streets of South L.A. on Wednesday in a pair of stolen police cruisers. The car chases ended in separate crashes. The thefts and chases sparked an investigation that revealed some of the cadets may have also stolen a bulletproof vest, two stun guns and two police radios, Beck told reporters last week. 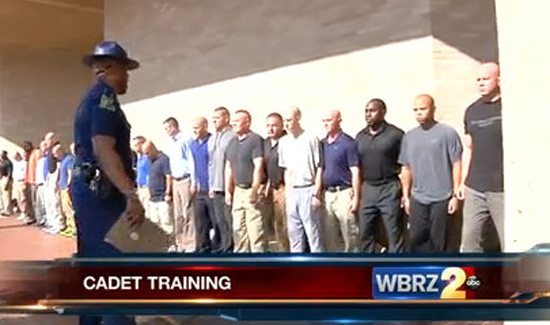 Since the arrests, the cadet program has come under intense scrutiny. The captains in both divisions will now meet one on one with every cadet “regarding the severity and seriousness of the recent incidents” along with the need to maintain ethics, the LAPD said in a statement last week. Police officials will also meet with the parents of cadets in those divisions. Investigators are trying to determine if other cadets were directly involved in the unauthorized use of LAPD patrol cars or knew of the thefts of the vehicles and other equipment.